SpaceX launched a robotic capsule into orbit today (April 18), kicking off the company's third contracted cargo mission to the International Space Station for NASA, along with an ambitious rocket reusability test. 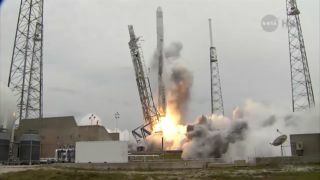 SpaceX's unmanned Dragon spacecraft blasted off at 3:25 p.m. EDT (1925 GMT) today from Florida's Cape Canaveral Air Force Station, riding into space atop the company's Falcon 9 rocket. Dragon is scheduled to rendezvous with the orbiting lab on Sunday (April 20), when it will offload nearly 5,000 lbs. (2,268 kilograms) of food, scientific experiments and supplies. The first stage is equipped with four 25-foot-long (7.6 meters) landing legs to help steady its descent toward the ocean, where SpaceX hopes to retrieve it by boat. Just how the reusability test went was not apparent immediately after liftoff. But company representatives would not be shocked or saddened if something went wrong, having pegged the endeavor's odds of success at less than 50 percent in the days leading up to launch. "The entire recovery of the first stage is entirely experimental," Hans Koenigsmann, SpaceX's vice president of mission assurance, told reporters Sunday (April 13). "It has nothing to do with the primary mission here." Today's launch initiates the third of 12 official supply missions that California-based SpaceX will fly to the space station for NASA under a $1.6 billion contract. Dragon is carrying some interesting cargo on this run. For example, it will deliver legs for NASA's humanoid robot Robonaut 2, which is designed to help astronauts perform menial tasks in space. Robonaut 2 will get to test out its new 9-foot-long (2.7 m) legs for the first time in June, NASA officials have said. Dragon is also toting a NASA laser-communication experiment called OPALS (Optical Payload for Lasercomm Science), as well as an experiment called Veg-01 that will help researchers learn more about growing food in space. A tiny NASA satellite called PhoneSat 2.5 also hitched a ride on Dragon today. As its name suggests, PhoneSat 2.5 is based on commercial smartphone technology. The idea is to demonstrate just how well spacecraft made with inexpensive, off-the-shelf electronics can perform in space, agency officials have said. Today's liftoff was originally slated to occur on March 13, but SpaceX pushed it out by about two weeks to tie up a few loose ends. The launch was delayed again when a fire damaged a ground-based radar system used to track liftoffs from Cape Canaveral. And a planned Monday (April 14) launch was scrubbed due to a helium leak on the Falcon 9's first stage. SpaceX isn't the only company flying cargo to the International Space Station for NASA. Virginia-based Orbital Sciences holds a $1.9 billion deal to make eight such flights using its Antares rocket and Cygnus spacecraft. The first of these missions blasted off in January.